Despite the many, many days of frigidly cold weather we've been having, there's still plenty going on in Jersey City and it's high time to be part of it! There are lots of events, Super Bowl related and not, happening all over the city and happily, many of them involve food and/or drink. I'm Here For The SUPER BOWL. Now Where Do I Eat? Well, friends (and strangers), it's here. Super Bowl Week! And more than that, Super Bowl Week in Jersey City! As has been noted, there is some contention over the fact that the 2014 Super Bowl is not being held in New York as advertised, but rather, in New Jersey. Whoever gets the credit, there is no denying that Jersey City is playing host to both teams and a whole bunch of fans. So, if you are visiting our wonderful city to better enjoy the event, welcome! If you live here and are just hoping to make it through the week, best of luck! And here's some hopefully useful food & restaurant information for visitors and residents alike. Jersey City, nicknamed Chilltown, also nicknamed the 6th Borough (although that one is less popular) is a bustling metropolis located in the Northeastern part of New Jersey, very close to Manhattan. It's made up of dozens of neighborhoods, each with their own character. For the purposes of this post, I'll primarily be focusing on Downtown Jersey City because that's the area being most prominently featured for the Super Bowl but the rest of the city should by no means be discounted. Luckily, Jersey City has a lot of great public transportation options including the PATH, bus, cabs, and Uber so no matter where you're trying to go, it shouldn't be too hard to get there. Congratulations to Sam a.m., Beechwood Cafe, Choc-o-Pain, Marco & Pepe, and La Conguita for their mentions in this month's NJ Monthly Magazine in an article about the best breakfasts in North Jersey! And congratulations to all of us who live here because we get to enjoy all these delicious places! Union Republic has installed a meat locker in their front counter with various cuts of meat for purchase! 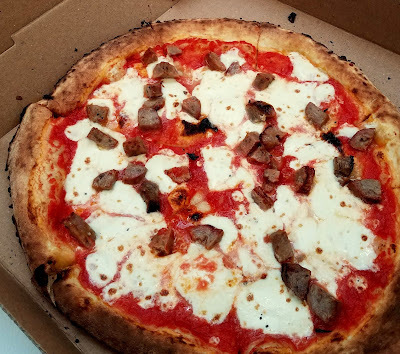 All meat is sourced from local NJ butcher Mezbah Meat Market. Congratulations also to Thirty Acres for their write-up on Immaculate Infatuation!Hint: it was a hit! Speaking of Thirty Acres, they just announced they will start having an online reservation system for all sized parties up to 8 people beginning Monday, Feb 3rd. Walk-in tables will still be available. As you might recall, Downtown Yogurt on Newark and Grove opened last week; luckily, a few days prior to Arctic Vortex pt. 2. While winter probably isn't the ideal time to open a frozen yogurt shop, I think I can confidently say that this shop will have no trouble attracting customers all year round. I stopped by opening night to check out what was on offer and give the yogurt a try. The space is bright and welcoming although I can see there being some traffic issues between the yogurt and the toppings if it gets crowded. If I counted correctly, there are 8 different yogurt/frozen dessert options and a whole table of toppings including nuts, granola, mini pb and mini raspberry cups, fruit (happily not floating in lots of sugary syrup), various small candies like m&ms and nerds, hot fudge, etc. One of the things I was happy to see is that there's a Greek yogurt option, a sorbet option, and a few non-fat and low-fat yogurt options - something for everyone! ME Casa is the type of place I'm always looking for, but rarely find. It's an underground alcove with dim lighting and less than 15 tables, atmospheric without being suffocating. Perfect for an intimate date, a few friends catching up, or even a small group just having fun. The servers seem intent on providing a good experience, sincerely exchanging pleasantries and keeping a watchful eye. All this plus delicious food. Boasting authentic, but with a twist, Puerto Rican food, ME Casa is not someplace I'd recommend for vegetarians or vegans, but would recommend for just about anyone else. 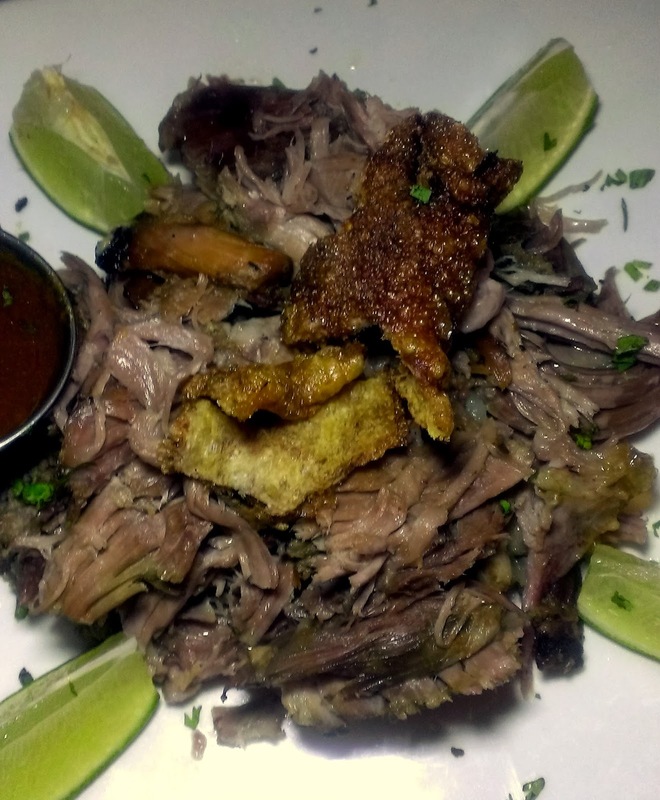 There are a lot of classic dishes here with delicious and familiar flavors being shown off in a new way.One of the best-known and most widely acclaimed dishes is the Mofongo - a bed of mashed and fried plantains topped with beef, chicken, or shrimp stew. 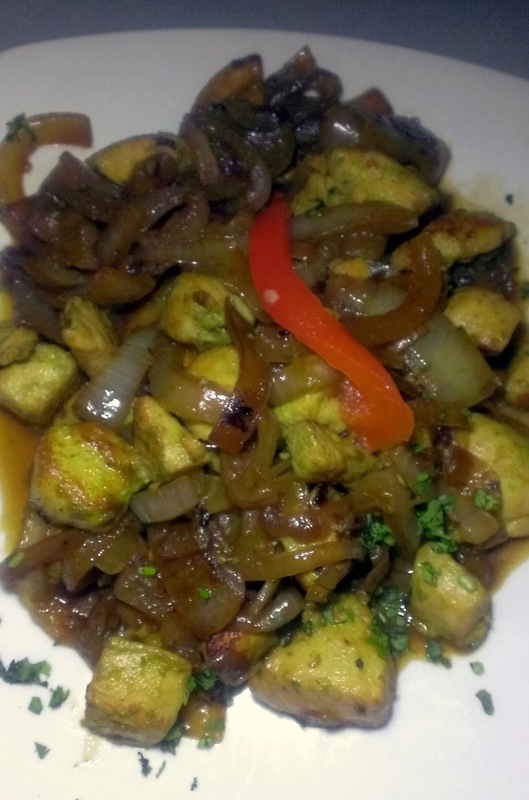 On one visit, I tried the chicken entree and on another, we ordered the mofongo appetizer which is three mini mofongos topped with whatever variety of stews you'd like - in this case, one chicken, one shrimp, and one beef (seems like the obvious choice really). The chicken seems to be the favorite, but all of them are excellent. The plantains are garlicky with a creamy texture and while each of the stews is slightly different, they are all very flavorful with a bit of peppery taste to them. Another favorite is the pernil (shown at the top) which is basically just served as a large plate of shredded pork. This is nothing to complain about as the pork is incredibly tender and juicy, highlighted by the simplicity of how it's served. The roast chicken was similar - fairly simple in preparation, it seemed like it had just been given a spice rub and then roasted, but came out tender and juicy. It was definitely well-seasoned, with lots of garlic and I think oregano. With the addition of the money sauce (ME Casa's green sauce), it doesn't get much better than this. 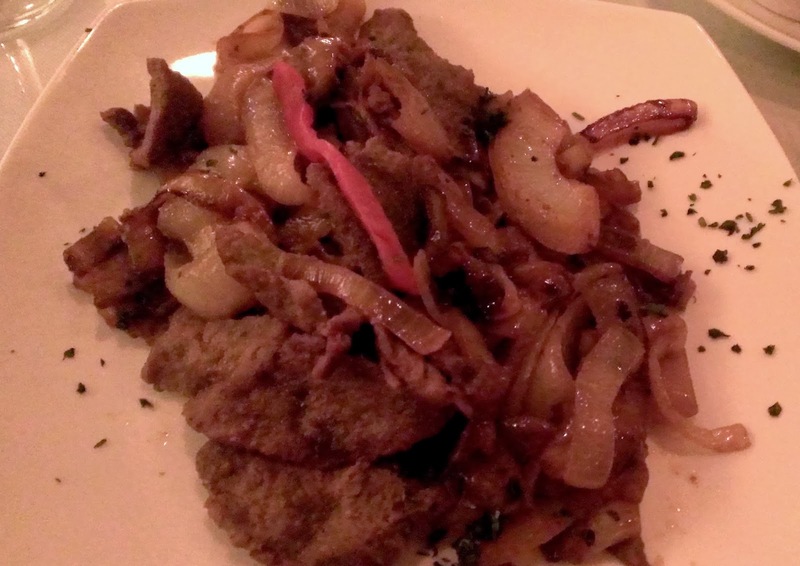 I've also tried the Pollo Boracho (drunken chicken) which was served with lots of perfectly cooked onions and the Bistec Encebollado (steak). Again, both excellent, perhaps slightly more complex in flavor. Everything has been well cooked and I strongly suspect this is one of those places where there's no bad order, just favorite ones. Help Jersey City Veggie Burgers raise a Kiva Zip loan - the money will be used to outfit a new kitchen and expand production, meaning more veggie burgers for all of us! The Jersey City Life has the info as progress continues on the restoration and expansion of Rumi Turkish Grill at 60 Sussex St. The restaurant remains open while the work is being done. Downtown Yogurt is Opening Today! Jersey City has another new addition today with the much anticipated opening of Downtown Yogurt! Originally expected to open last summer, there were some delays, but the past several weeks have been a flurry of activity as machines and furniture were moved in and employees were trained. They will open at 12pm today and stay open until 11pm tonight so there's plenty of time to go try it out! Hudson Restaurant Week officially starts today! Running the typical two week from today, January 13 through January 26th, this year, many restaurants are offering a special Super week in honor of the Super Bowl so now you have even more time to try all the wonderful restaurants in Hudson County. Asian Food Market, an Asian specialty market and grocery superstore, opened up at 701 Rt. 440 last Friday and early reports are praising the wide selection and excellent prices so head over and stock up! La Festa Italiana has set the dates for the 2014 festival so mark your calendars now for August 13th - August 17th! Vendor and Merchant information forms are available on the website. Despite still being listed as of 11pm 1/9/2013, Grove Square Bistro has stated they are NOT up for sale. According to their twitter, it was an accidental posting on behalf of the broker. They have not responded as to why there was a broker listing at all but did state that work on the speakeasy/nightclub/coffee shop has begun. I'm being absolutely sincere when I say I don't bear anyone involved at this place ill will and will continue to hope for the best, but the number of responses I received and the enthusiasm I saw about wanting something else here or not liking the current restaurant is pretty indicative to me that Grove Square Bistro isn't what it could and should be. I hope that with time it improves or evolves into something Jersey City can be excited about. For those of you who might have missed it, Grove Square Bistro is up for sale for $3.8 million. I don't know the entire story behind the sale nor do I like to see local businesses do poorly, but I was not a fan when I tried this place and have never been able to bring myself to go back. Like many others, I loved the space but found not much there was being well-executed. I don't know the exact rules of this kind of sale and what can be done with the space and business names, but I do know there's a liquor license and a lot of equipment already there so I've been spending a lot of time dreaming about what I'd love to see move in. After a long wait, and much anticipation, Word Bookstore finally opened a few weeks ago and then this past Saturday, they opened up their cafe (including a walk-up window! Genius!). They're serving Stumptown coffee with a full menu of different beverages (caffeinated and non) as well as a variety of baked goods from different vendors, including some from local catering company and bakery, Bread and Spoon! I know things have been a bit quiet on the blog-front lately so sorry about that. 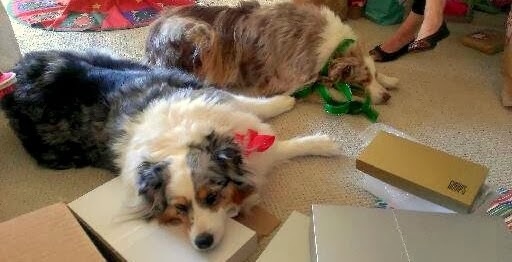 I was in San Francisco, visiting my family for the holidays (see tired dogs above) and while I took a break from photographing every single thing I ate, I did take some, so enjoy! San Francisco and the entire bay area has some absolutely amazing food that I've enjoyed over the years, but every time I go home, there's always more to try. This time around, I'd been reading a lot about Josey Baker, owner and baker at The Mill. 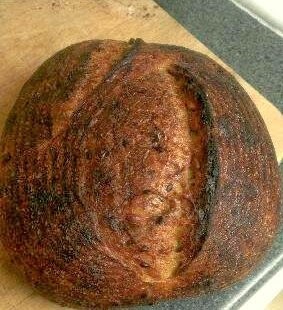 While I didn't actually make it to The Mill, I happened to be shopping at Bi-Rite one evening (where I got some wonderful housemade merguez sausage - incredibly flavorful although I wouldn't have minded a bit more heat) and also found a loaf of Josey Baker's seeded bread. The bread was substantial and hearty with a lot of nutty flavor from the toasted seeds.It had a nice crust that didn't break any teeth but was dense and soft on the inside. I can only imagine how fantastic it would be fresh and hot out of the oven but even not, I had no trouble making my way through this. 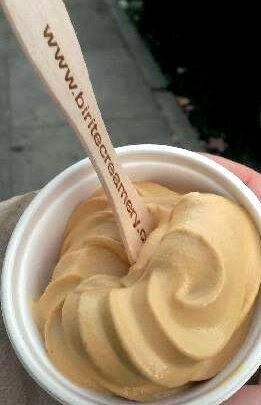 Also while at Bi-Rite, I also stopped by the creamery to enjoy some of their salted caramel ice cream. While they're known more for their traditional ice cream scoops, I opted for the soft serve (it was a shorter line) and thought the flavor was better for it. It had that complex, dark, slightly burnt taste of really excellent caramel with just a touch of mild saltiness. It was smooth and creamy while not losing the intensity of the caramel flavor. Don't forget, Hudson County Restaurant Week starts next Monday, January 13th! Start making your reservations now! Iron Monkey is having a Karaoke Night next Saturday, January 11th beginning at 10 pm with lots of drinks specials so stop by!